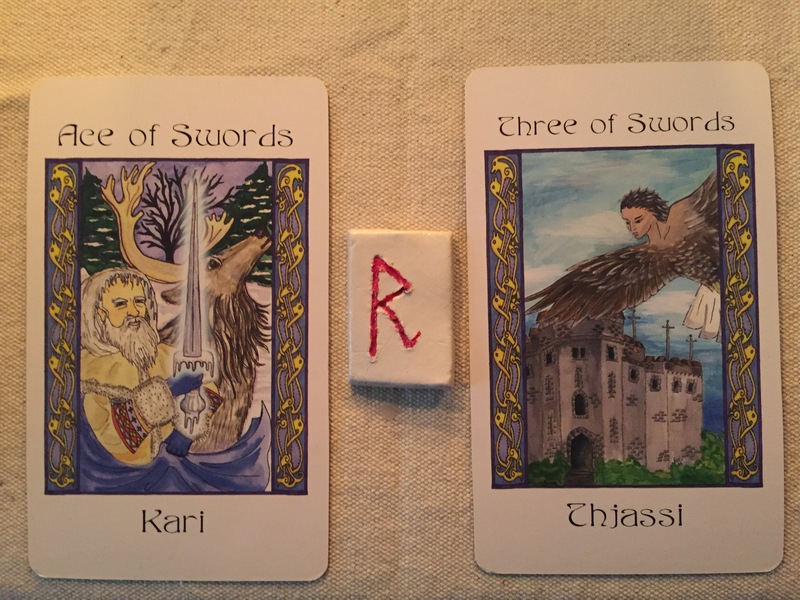 Today’s Draw: Kari/Ace of Swords; Raido; Thjassi/Three of Swords. The Year of the Fire Monkey continues at a brisk pace. Remember to breathe. 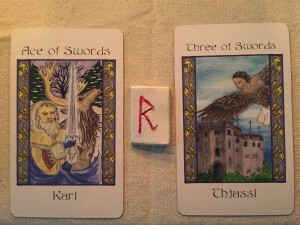 Kari brings the mental clarity and focused intellectual energy to deal with everything on your dance card. The key is to remember to take things one at a time. Multitasking is a myth, and not a helpful one. Neuroscientists have shown again and again that splitting your attention does not actually get things done any faster, and will often result in the set of tasks taking more time to complete than if you had simply done them sequentially. Raido speeds things along, continuing Mjol’s influence from the past two days. Much progress can be made, but be aware of how fast you are actually moving, and make sure you are not missing important details or skipping necessary steps. Take care that you are not running over others, or running yourself ragged. Thjassi cautions against rashness and poor boundary awareness. If you try to sail over another’s boundary today, you may find yourself burnt badly. Stop, think, then act. If you need someone to shift their boundaries, use reason and logic–don’t just try to force your way through. And remember, No Means No. If you hit a wall, pull back and consider your other options. Pace yourself, look at the map, and watch the road. A runaway chariot crashes and creates more problems than you were able to solve before things went awry.